Trelleborg’s engineered products operation is growing its portfolio of offshore floatover solutions, with a custom designed skirt pile gripper. Add to this its grout seal, diaphragm closure and grout packer products, and Trelleborg customers can now specify a total sub-structure leg can system from one source. The skirt pile gripper (SPG) is welded onto the upper section of a platform’s jacket skirt pile sleeves and is designed to create a temporary connection between the pile and jacket during the grouting process. With unique biting teeth for increased contact area, Trelleborg’s innovative design delivers a firmer grip. This fixing method reduces risks during platform installation, as it guarantees stable working conditions, even in inclement weather. “By growing our portfolio to offer a total leg can system solution, customers can benefit from streamlined procurement, reliable functionality and interfacing of the entire system from purchase through to delivery from one solution provider,” adds Chia. Trelleborg’s custom-made SPGs can be designed to have a holding capacity of between 500 MT and 3000 MT and are compatible with all offshore oil and gas and windfarm HVDC jackets. Working at operating pressures of 200 bar and higher according to customer testing requirements, and water depths of up to 250 meters, Trelleborg’s SPGs exceed all relevant client standards and is DnV GL certified. 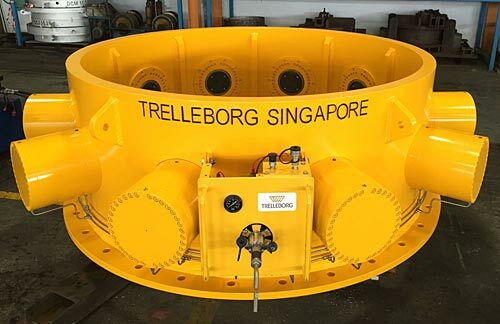 Trelleborg’s SPGs are fully developed and tested in-house at its facility in Singapore. Full scale testing, biting teeth friction testing and pressure holding testing are all carried out and exceed client specified standards to ensure Trelleborg’s SPGs perform during the critical grouting process.